امیرشقاقی, فرحناز, هووانلو, فریبرز, نورشاهی, مریم. (1395). تأثیر هشت هفته تمرینات سرعتی تکراری در شرایط هایپوکسی و نورموکسی بر رکورد شنای شناگران نخبه دختر. 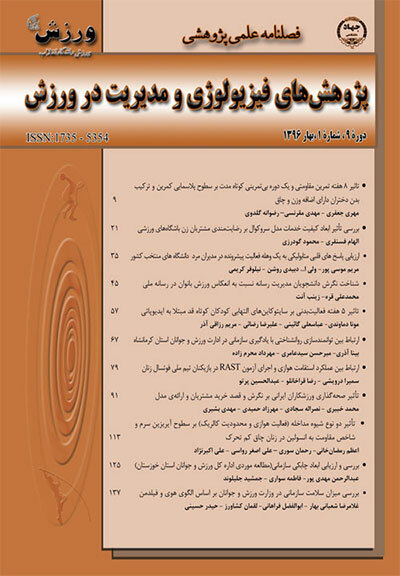 پژوهش های فیزیولوژی و مدیریت در ورزش, 8(3), 131-144. فرحناز امیرشقاقی; فریبرز هووانلو; مریم نورشاهی. "تأثیر هشت هفته تمرینات سرعتی تکراری در شرایط هایپوکسی و نورموکسی بر رکورد شنای شناگران نخبه دختر". پژوهش های فیزیولوژی و مدیریت در ورزش, 8, 3, 1395, 131-144. امیرشقاقی, فرحناز, هووانلو, فریبرز, نورشاهی, مریم. (1395). 'تأثیر هشت هفته تمرینات سرعتی تکراری در شرایط هایپوکسی و نورموکسی بر رکورد شنای شناگران نخبه دختر', پژوهش های فیزیولوژی و مدیریت در ورزش, 8(3), pp. 131-144. امیرشقاقی, فرحناز, هووانلو, فریبرز, نورشاهی, مریم. تأثیر هشت هفته تمرینات سرعتی تکراری در شرایط هایپوکسی و نورموکسی بر رکورد شنای شناگران نخبه دختر. پژوهش های فیزیولوژی و مدیریت در ورزش, 1395; 8(3): 131-144. 05/0 p≤ تجزیه و تحلیل شدند. نتایج نشان داد که هشت هفته تمرینات سرعتی تکراری باعث بهبود رکورد شنای 100متر(013/0=P) و شنای 200متر (009/0=p) در شرایط هایپوکسی نسبت به نورموکسی می شود. The aim of this study was to compare the effect of 8 weeks of repetitive sprint training in hypoxia and normoxia conditions on swimming record of female elite swimmers. The subjects included 30 female elite swimmers who were randomly divided into 3 groups (each group 10 subjects): 2 experimental groups (hypoxia and) and one control group. Training protocol was administered to both experimental groups for 8 weeks, 2 sessions per week with swimming ergometer and 3 sessions in the swimming pool. The protocol was designed for both experimental groups with similar intensity and duration (nine 30-sec. attempts at the intensity of 80% of maximum performance with two minutes of rest) on swimming ergometer. Hypoxia group performed the training in hypoxia condition with %14 of Fio2. The control group had only 5 session of regular swimming in the pool. Results were analyzed using ANOVA at P≤0.05. The results showed that 8 weeks of repeated sprint training improved 100 m swimming record (P=0.013) and 200 m swimming record (P=0.009) in hypoxic condition compared with normoxia condition. Barnett C. Carey M. Proietto J. Cerin E. Febbraio MA. Jenkins D. (2004). Muscle metabolism during sprint exercise in man: influence of sprinttraining. J Sci Med Sport; 7(3):314–22. Bonetti Darrell L. and Hopkins. (2009). Sea-Level Exercise Performance Following Adaptation to Hypoxia A Meta-Analysis. Burgomaster KA. Heigenhauser GJ. Gibala MJ. (2006). Effect of shorttermsprint interval training on human skeletal muscle carbohydratemetabolism during exercise and time-trial performance. J Appl Physiol; 100(6):2041–7. Burgomaster KA. Hughes SC. Heigenhauser GJ. Bradwell SN. Gibala MJ. (2005). Six sessions of sprint interval training increases muscleoxidative potential and cycle endurance capacity in humans. J Appl Physiol; 98(6):1985–90. Desplanches D. Hoppeler H. Linossier MT.(1993). Effects of training in normoxia andnormobaric hypoxia on human muscle ultrastructure. Pflugers Arch; 425:263–7. 10.Faiss R. Girard O. and Millet G.P. (2013). Advancing hypoxic training in team sports: from termittent hypoxic training to repeated sprint training in hypoxia. Br. J. Sports Med; 242 47(Suppl.1): i45-50. 11.Galvin HM. Cooke K. (2013). Sumners DP.Repeated sprint training in normobaric hypoxia. Br J Sports Med; 47:i74–9. 12.Gatterer H. Klarod K. Heinrich D. Schlemmer. P. Dilitz S. Burtscher M. (2015). Effects of a 12-day maximal shuttle-run shock microcycle in hypoxia on soccer specificperformance and oxidative stress; Appl. Physiol. Nutr. Metab. 14.Gibala MJ. Little JP. Van EM. (2006). Short-term sprint intervalversus traditional endurance training: similar initial adaptations inhuman skeletal muscle and exercise performance. J Physiol; 575(Pt 3):901–11. 16.Hoppeler H, Vogt M. (2001). Muscle tissue adaptations to hypoxia. J Exp Biol 204(Pt 18):3133–9. 19.Laursen PB. Jenkins DG. (2002). The scientific basis for high-intensityinterval training: optimising training programmes and maximizingperformance in highly trained endurance athletes. Sports Med; 32(1):53–73. 20.Levine BD. and J. Stray-Gundersen. (1997). Living high-training low: Effect of moderate-altitude acclimatization with low-altitude training on performance. J.Appl;Physiol; 83:102-112. 21.Macpherson RE. Hazell TJ. Olver TD. Paterson DH. Lemon PW. (2011). Run sprint interval training improves aerobic performance but notmaximal cardiac output. Med Sci Sports Exerc;43(1):115–22. 23.Millet GP. Faiss R. Brocherie F. et al. (2013). Hypoxic training and team sports: a challengeto traditional methods? Br J Sports Med; 47:i6–7. 27.Powell F.L. and Garcia N. (2000). Physiological effects of intermittent hypoxia. High Alt. Med. Biol. 1:125-136. 29.Pyne David B. Trewin Cassie Band. Hopkins William G. (2004). Progression and variability of competitive performance. 31.Schmidt W. (2002). Effects of intermittent exposure to high altitude on blood volume and erythropoietic activity. High Alt. Med. Biol ;3:167-176. 32.Truijens M.J. Rodríguez F.A. (2011). Altitude and hypoxic training in swimming. Dins: Seifert L. Chollet D. Mújika I. (eds. ), World Book of Swimming: From Science to Performance, Chapter 20. Hauppauge, New York: Nova Science Publishers Inc; pp. 393-408. [ISBN 978-1-61668-202-6]. 33.Vogt M. Puntschart A. Geiser J. (2001). Molecular adaptations in human skeletal muscle to endurance training under simulated hypoxic conditions. J Appl Physiol; 91:173–82. 35.Weyand PG. Lee CS. Martinez-Ruiz R. Bundle MW. Bellizzi MJ. (1999). Wright S. High-speed running performance is largely unaffected by hypoxic reductions in aerobic power. J Appl Physiol;.86(6):2059–64. 36.Wilber R.L. (2004). Performance at sea level following altitude training. In: Altitude Training andAthletic Performance. Champaign, IL: Human Kinetics; pp. 83-118.